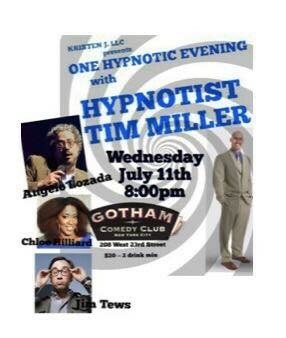 Tim Miller brings the passion and energy developed through the years to the stage using both comedy and hypnosis. StageHypnosisLive.com was awarded Best of 2015 by national entertainment booking website, Gigmasters. Tim provides an incredible funny and entertaining show. You will witness your friends, family, co-workers and other audience members have the time of their lives while under hypnosis. The great thing about stage hypnosis is the star could be YOU and/or members of your group. The possibilities are endless, from a participant acting as if they were a famous entertainer to a man believing he is pregnant, you will not be disappointed. With Stage Hypnosis, there is never a repeat show performance. All shows are unique. This is an incredibly fun experience that allows members to relax, laugh and build memories.